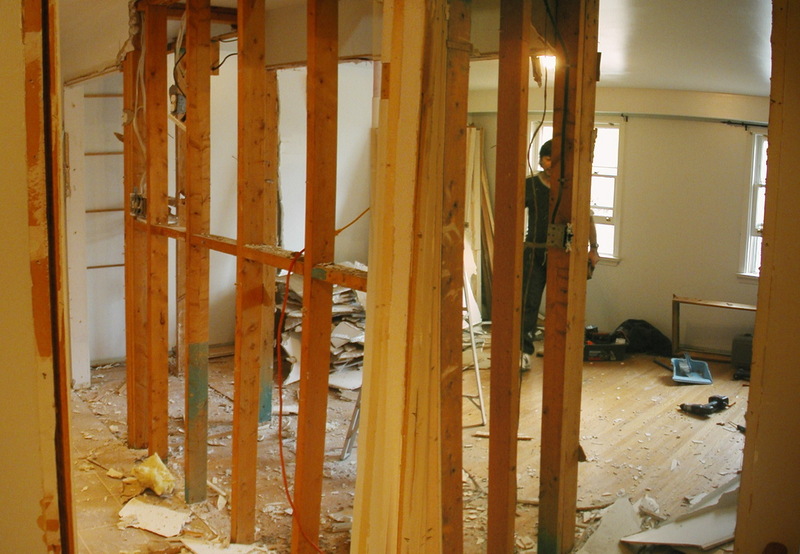 Well, after saving up for a few years, we finally started Phase II of our bedroom renovation. Phase I was getting rid of the bedroom that had been turned into a huge bathroom with hot tub (not in lovely condition), and turning it into a smaller bathroom. We were left with a weird half room. Phase II was expanding our bedroom into this weird half room, giving us an expanded master bedroom with an ensuite bathroom. On finding contractors: horrid job. Hate doing it. I must have called 12 or so. Of that, about 6 called me back and made appointments. Of that, 2 actually showed up. We also asked our neighbour (a contractor) to look at it. We decided not to go with our neighbour: if only because I was afraid it would strain relations if something didn’t go well, and I knew he was very busy. One thing I wouldn’t be able to deal with was delays once the job was started. Mostly because Reid and I had to move out of our bedroom, and squeeze into my office. Anyway, we were told they could start fairly soon. A couple of days later, two guys came by and I explained the whole reno. I showed them my sketch, they took a quick look, and flipped. One of them seemed quite upset (although I think that must be his personality). He started saying the only way to do it was to replace all the beams in our attic. Ya, right. They said they’d go back and talk to an architect. OK – now I was upset. But our contractor decided to give the job to a different crew, reassuring me that these new guys were really good. Meanwhile, I had a sudden inspiration and realized there was a fairly simple way to support the whole thing. A few weeks went by before they could start. I hated that waiting period. 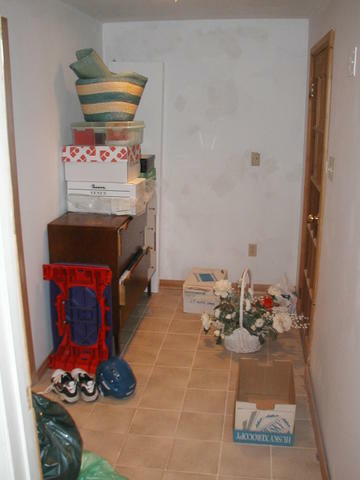 Most of our stuff was out of our bedroom, and we were poised to move the rest out on a moment’s notice when we heard they were ready to start. As it turned out, I’m glad we had a whole Sunday to do it. That last little bit of moving took the whole day. 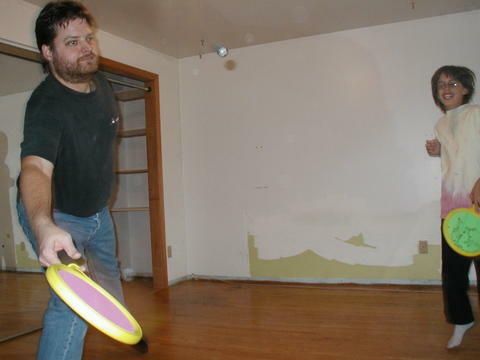 Sunday night, we spent the evening playing racquet ball in my empty bedroom (with those tiny incredibly bouncy balls). I went to work and less then 2 hours later, around 10am, Reid e-mailed pictures. All the walls had already come down. By the time I came home that evening, the walls were completely removed, the supports were in, buried in the ceiling and walls. During the day, the fellow showed Reid how strong the supports were by jumping up, and doing a chin up. Reid said they didn’t budge. The roof is actually supported almost completely by the outer walls, and not by the beams running in the attic. So these 2 supporting walls were only holding up the ceiling drywall. Kind of overkill. I think I know exactly why there were 2 supporting walls 2 feet apart, but I’m sure I’ve bored enough people. If you’ve read this far and are curious, ask me. Last week went by quickly, and we’re nearing the end of the icky drywall phase. I understand tomorrow is the major drywall sanding day. I’m so glad Reid’s home: especially when he vacuums before I get home!